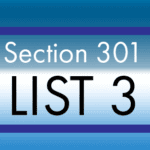 Effective July 6, 2018, the Trade Representative imposed additional 25% duties on goods of China classified in 818 8-digit subheadings of the Harmonized Tariff Schedule of the United States (HTSUS), with an approximate annual trade value of $34 billion, which is also known as the “Section 301 – List 1” tariffs. 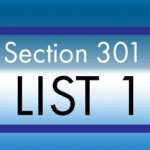 Moreover, some exclusions for Section 301 “List 1” products were announced in early February 2019. Any organization that imports using those tariffs numbers, regardless if the organization was the actual exclusion petitioner or not, is able to use the exclusion. The same is true for a second batch announced listed below. 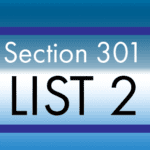 Just this month, March of 2019, the United States Trade Representative announced another set of exclusions available for some selected Section 301 “List 1” products. The following products will be excluded from the additional 25% duty imposed on products declared on “List 1” imports from China mentioned above. The exclusions will be retroactive to July 6, 2018, just as the first batch of exclusions is, and will remain in place until March 25, 2020. Please email consulting@scarbrough-intl.com for a free 30-minute consultation or help with your product exclusions.